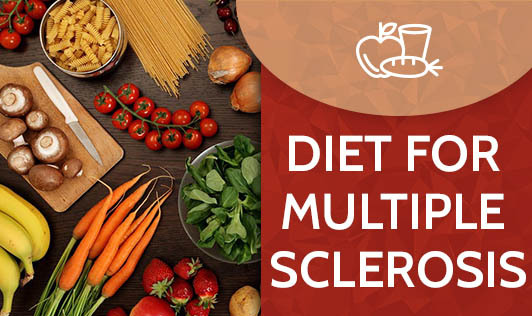 The main role of diet in multiple sclerosis is to enable people to manage common problems which include fatigue, incontinence and constipation and to help them avoid exacerbating other symptoms. Eat a diet high in protein and anti-inflammatory oils such as nuts, seeds, and cold-water fish. Consume lots of orange, yellow, and dark green vegetables. Eat whole grains such as brown rice and whole grain corn which provide a fiber boost. Many individuals with multiple sclerosis are sensitive to foods that contain gluten. So if there is any gluten sensitivity avoid foods like wheat, wheat products, oats, barley, and rye. Eliminate refined foods, alcohol, caffeine, saturated fats (animal products), and additives such as aspartame. Eat a diet rich in omega-6 and -3 essential fatty acids as they might slow the progress of the disease and reduce the severity and duration of relapses. Fish, flaxseeds, soyabean, and almonds are good sources. Another major factor in multiple sclerosis is vitamin B12 deficiency. Observations suggest that there is a significant association between MS and vitamin B12 deficiency and that vitamin B12 deficiency should always be looked for in MS. So include foods rich in B12 like organ meats, chicken, fish such as salmon, halibut and tuna, curd, milk, cheese, and egg.